Happy 17 days before Christmas! I'm slowly but surely getting everything Christmasified around here. I've been trying not to do the same ole same ole around here this year. Just for the heck of it. But that means I don't have last years experience to draw on and I have to keep experimenting. And the mess! Holy moly it makes a mess to take out the boxes, unload the boxes, move all the stuff you have out that's in the way. And if your a little crazy like me, well you decide to paint your fireplace, mantle and hearth right in the middle of it all. A few weeks ago I went out to the Hobby Lobby to look for large packages of glue sticks. I've been on a little soap box about glue sticks lately. They are entirely too expensive and you can't get more than 50 in a package. That's ABSURD! I've made about 25 pine cone trees this year and that's a lot of glue. And that pine cone wreath I made - it took like 35 glue sticks just for the wreath. Anyway, they didn't have any large packages either, but I did get to look around at all the stuff. Man, they have a lot of stuff. I bought these three little countrified poinsettias because I thought they were cute. But I didn't know what I would do with them. But today I got a brain storm. Or a brainstorm. I guess it's brainstorm. If I had an actual brain storm it would probably be more like my brain exploding. And I already have a mess to clean up. A big one. My brainstorm said "put those poinsettia things in that grain sieve you bought at that estate sale two summers ago and haven't done anything with." Yep. That's what it said. 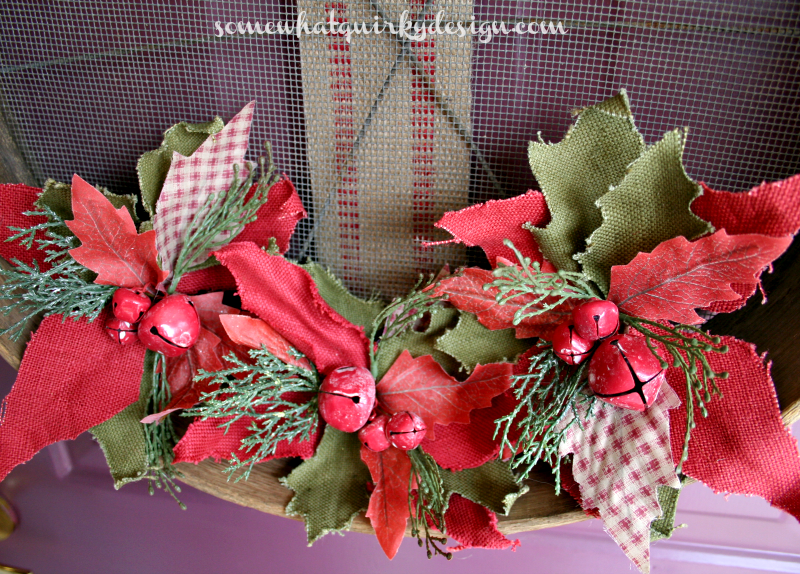 I stuck those poinsettia things in the grain sieve and tacked on some upholstery webbing I had left over after this project. Then I hung it over the door for pictures. I actually had to hang it on the storm door because the storm door won't close if it is hanging on the door door. That stinks. 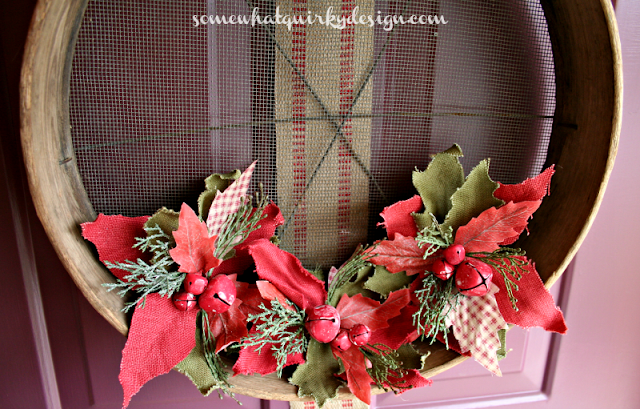 Because it is hard to hang wreaths on storm doors. This grain sieve thing is heavy. I have one of those storm door wreath hangers - the kind with magnets that hold on either side of the glass. It is seemingly the strongest magnet I've ever used. In fact, without the glass between the two pieces it is almost impossible to get them apart. But I've never been able to get it to work when their is actually glass between the magnets. 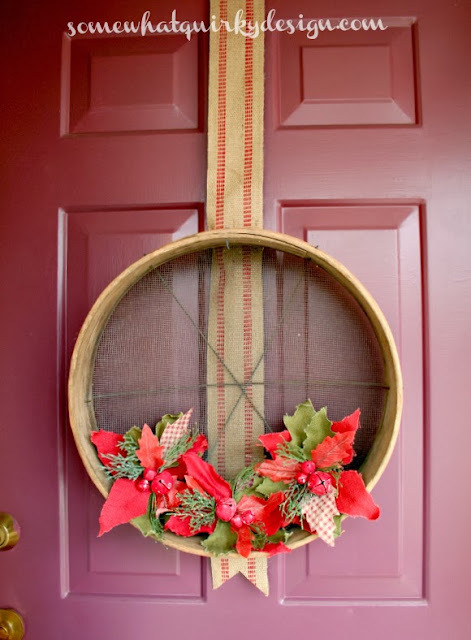 It does ok until you put the wreath on the hook. The wreath starts slowly but surely sliding down the door. That does me no good whatsoever. Anyway, I was able to rig it up so that I can reasonably hope that it will stay up until after Christmas. Hope the wind doesn't blow too much. Can I just say that this very very very easy Christmas wreath is WAY cute! Your right, it is WAY, WAY, cool! Adorable! I love it. Clever use for the sieve. I pinned it to Junkers United Christmas board. Too cute! I have one of those things too! But, I can't handle anything else this year....filing it away for another year!